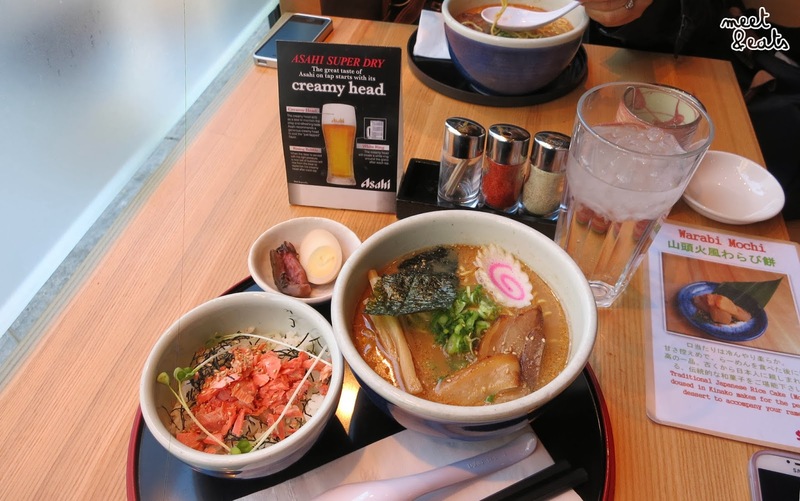 I have not touched a bowl of Ramen since my last incredible experience at Menya Noodle Bar during my ‘Birthday week’ in 2012 (Yes, that’s a thing). Hitting up three Japanese joints in a single weekend was no biggie, Sushi Rio, Wagaya and Menya Noodle Bar, I got this, and each were fabulous. During my last Japanese feed, I was accompanied by my wonderful sister and ex-neighbour, who always knew the go-to places for the best of the best in Sydney. We were seated along a row of open-spaced tables, nice and cozy, rubbing shoulders with other diners in terrific (Instagram) lighting, all while admiring monochrome photographs stretched across the walls around us. 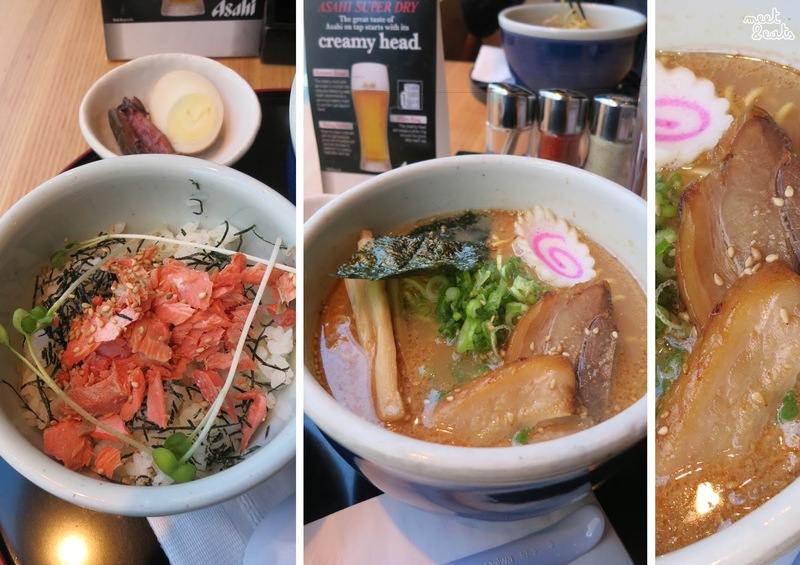 An evening of catching up, the best Ramen combo I’ve had to date, and many smiles, these vivid memories of my carefree-self began to flow my mind on my way to Santouka Ramen. One of the things I like about Toronto, is how much restaurants and retails stores really get into play into celebrating each holiday. Santouka was adorably decorated with little pumpkins along the shop window, and hardly-scary mini ghosts at each corner of the restaurant. But, during Christmas time it’s an incredible step up. The shock of so many things going on in one shop display window at The Bay and then the feel of walking into Eatons Centre in early December and being faced with multiple gigantic twinkly reindeers plopped across the mall (here and here). I definitely thought something was wrong and felt strangely uncomfortable, but now, it’s a much more pleasant feeling gazing up at these incredibly over-sized reindeers. 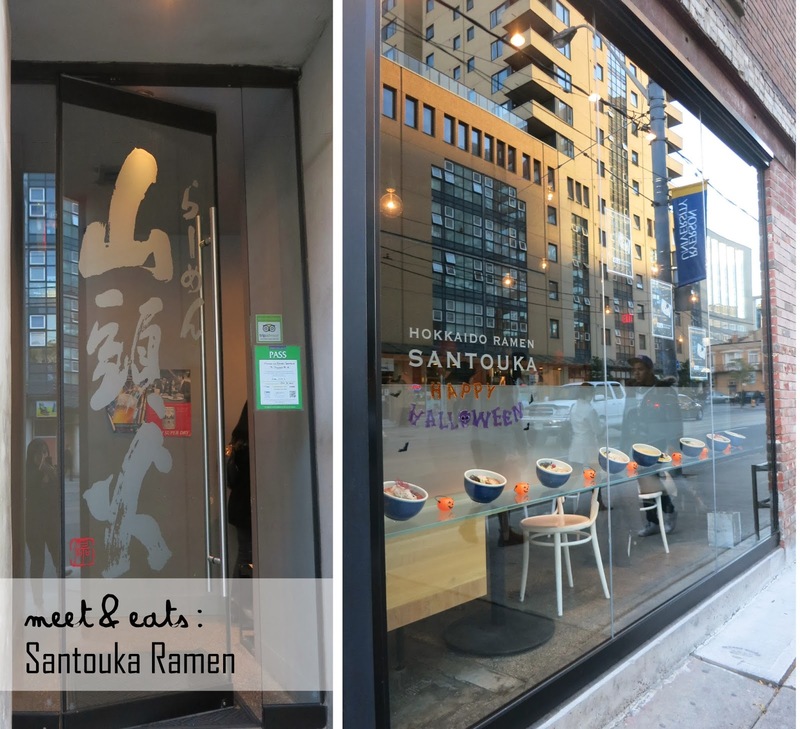 On the hunt for my mate’s craving of Japanese food by Ryerson, a quick Yelp search and we found Santouka Ramen, a short walk away. Hungry and seated in a corner booth by the window, a look around and to not much surprise, there were groups of students chatting and chowing away. I already had my eye on the prize. Whenever I am at a Japanese restaurant for Ramen, I will always one-up and grab the set. I love the flavours of everything together! It’s exactly how eating Ramen should be. Broth, the perfect chew of noodles, pickles and rice. I ordered my broth with a little bit of lard. I probably could have done without the combo though. The rice bowl wasn’t very fun at all, with little pieces of salmon and flavours which hardly existed. Even the pickles weren’t doing it for me (and pickles always save the day!). The broth was fabulous though, it held the perfect amount of creaminess, but disappointingly, I was only given two melt-in-your-mouth pieces of pork (I’m a growing woman!) – but more than half of the pork cuts were fat. The noodles simply were not right at all, much more on the harder side but not as chewy as I’d like. Only because there are so many other Japanese places downtown, I would not come here again. I’m a one-time pleaser. It was a great place to kick back for our speedy hour and a half., but both our thoughts of the Ramen were the same. I still haven’t fulfilled my Ramen cravings. Provides that cushion for the pushin.